Today is Throwback Thursday, and continuing my theme of celebrating the return of the sun – both in Southwest Florida and Southeast Texas, I’m recalling one of my all-0time favorite songs to wake up to in the morning – Good Day Sunshine by (who else?) The Beatles. Paul wrote it at John’s house in Kenwood on a sunny day in late May or early June. Paul later said that he was inspired to write a song as carefree and upbeat as the Lovin’ Spoonful’s Daydream. He wanted to evoke “the same traditional, almost trad-jazz feel.” He definitely succeeded, wouldn’t you agree? Interestingly, Lovin’ Spoonful songwriter John Sebastian had no idea that he and the Spoonful had inspired the song. 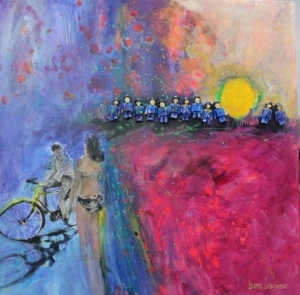 I emulated this same carefree, upbeat feel in my painting. Notice the casual, easy-going manner in which Paul straddles his bike as he encounters the bikini-clad dark-haired girl standing before him. 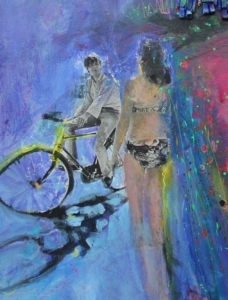 Both the bike and the girl reflect the sun, with both casting amorphous, blurry reflections on the rainy-soaked roadway. As the sun breaks through the stormy clouds, everything is reinvigorated. Even the reds and purples of the strawberry field emanate a vibrant, positively-charged f requency or vibration. This painting also has a sculptural aspect. 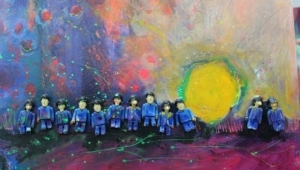 The blue Beatles spanning the horizon line are three-dimensional figures that complete the picket fence that divides the sky from the foreground. So here’s to celebrating the sun’s return. We take it for granted when it’s hot, bright and blindingly brilliant. But we sure miss the sun when the rain comes and the clouds obscure.